3 days left in the work week followed by a glorious 3 day weekend! I’m definitely looking forward to an extra day off, especially since it is the last one (minus weekends of course) until Spring Break! 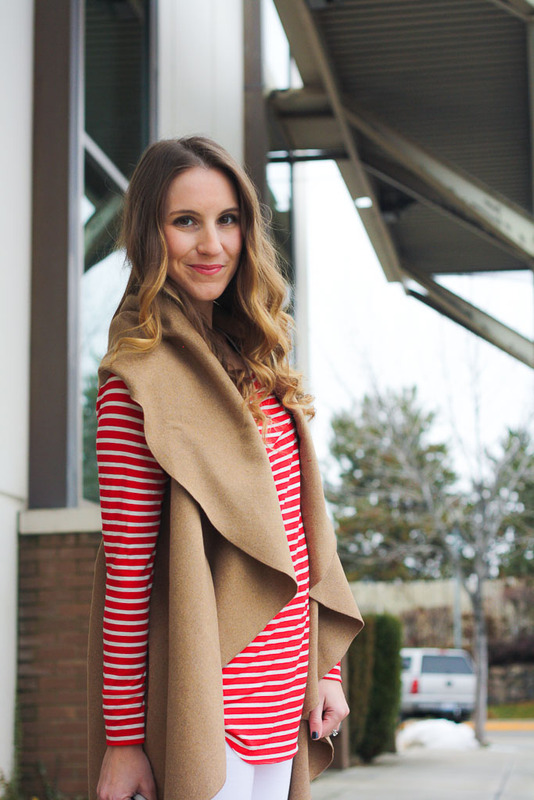 I bought this top during the Nordstrom sale this summer and it has been one of my closet staples this winter! 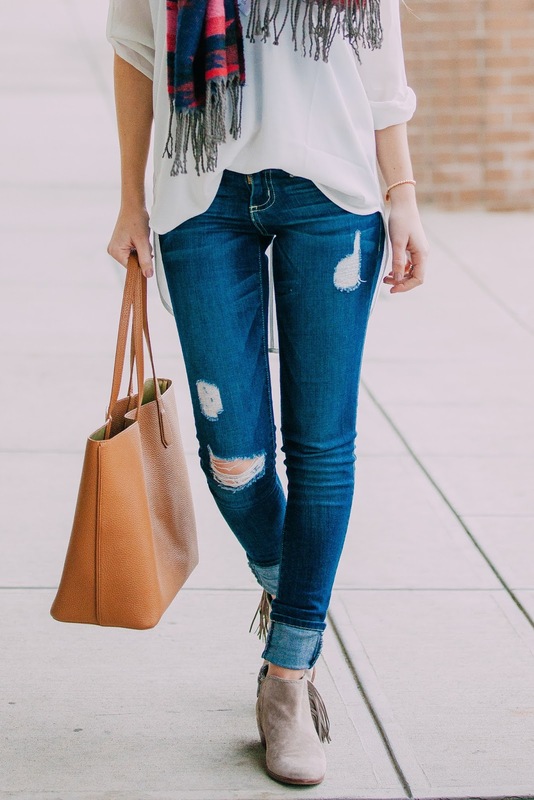 It’s such an easy piece to throw on with a great pair of jeans, but also layers well with sweaters and scarves. 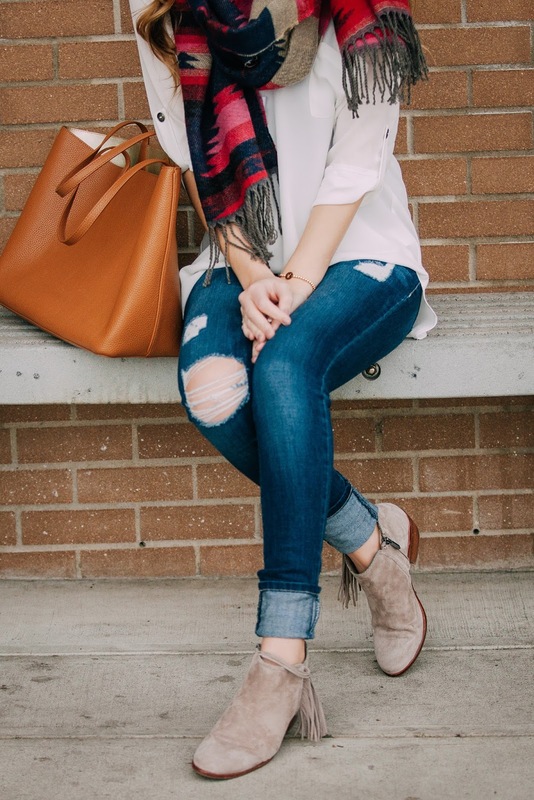 Speaking of scarves, this one was recently re-stocked and is such a fun way to bring some color into your outfit. The vibrant pattern isn’t the only thing that makes it a great buy…it’s ridiculously soft and so warm! Confession time. I clearly cannot stop wearing my white denim this winter, as documented here and here. It’s easy to wear and goes with just about anything, making it easy for these to be one of the first pieces I grab when getting dressed. 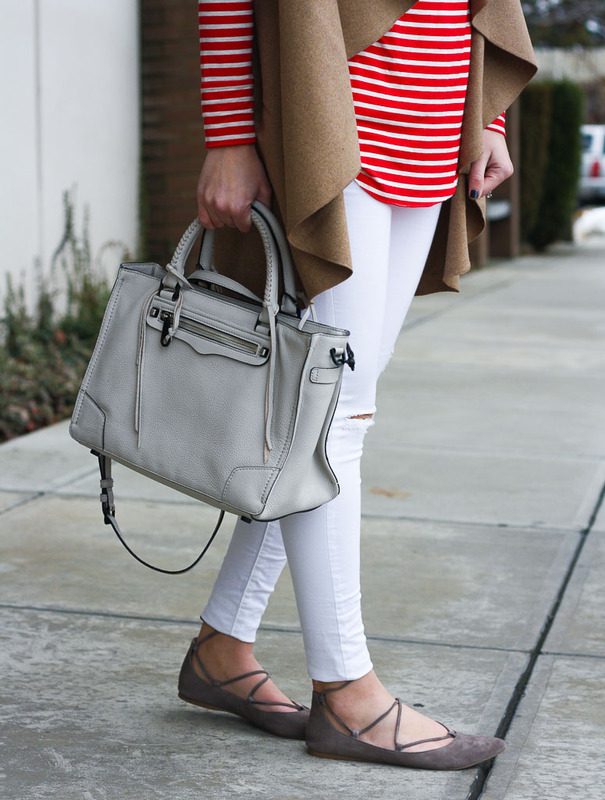 I love a great striped shirt, so it was a no-brainer to pair it with my favorite pair of white jeans. 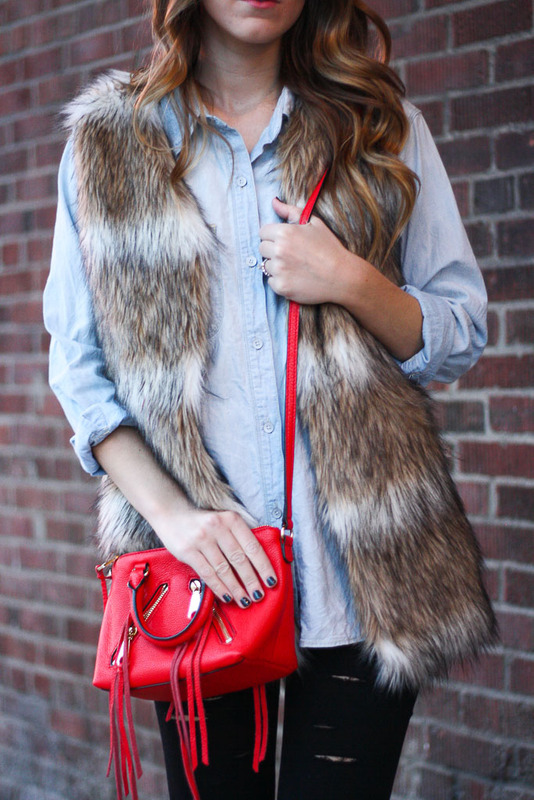 This camel vest was the perfect addition to top off the look. It’s such a fun piece and I love the way it flows. The best part? It’s only $15…a total steal!! I definitely recommend adding this little number into your wardrobe to throw in to your winter mix! 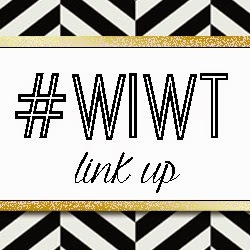 Today’s blogger of the week from last week’s link-up is Amanda of A Good Hue! Amanda’s casual winter attire has me craving one last snow day just so I can re-create this cozy look! 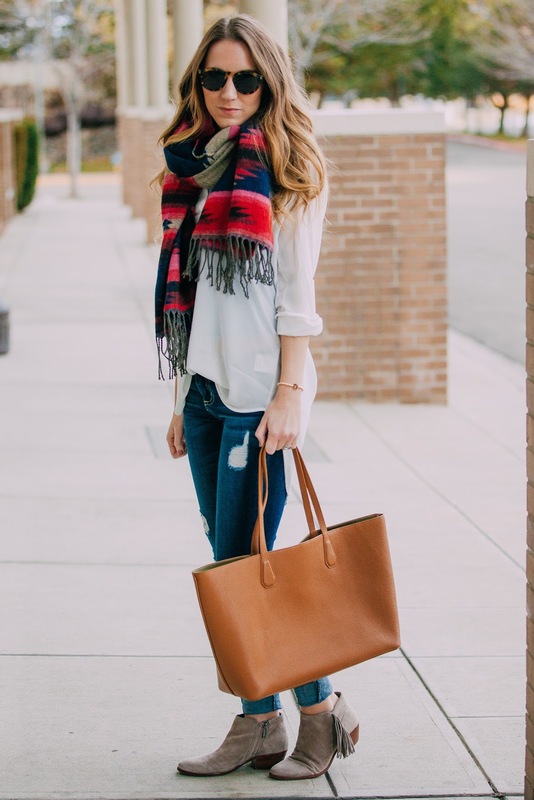 The mix of plaid and stripes is is such a perfect combo for a snowy afternoon! Is anybody else excited for January to be over? This January in particular has just dragged on. It seems like such a blah month, especially as it lands right after the holidays. I’m ready to move on and move toward warmer weather! Stripes and plaid just happens to be my all time favorite combo. Plaids and stripes are so easy to mix and match and tend to have a re-occurring role in my day to day outfits. This plaid scarf has been on repeat since I purchased it this fall. It goes with everything and is so cozy for the winter weather andddd they just re-stocked it! I’ve had this vest for over a year now and it continues to be one of my favorite winter pieces. 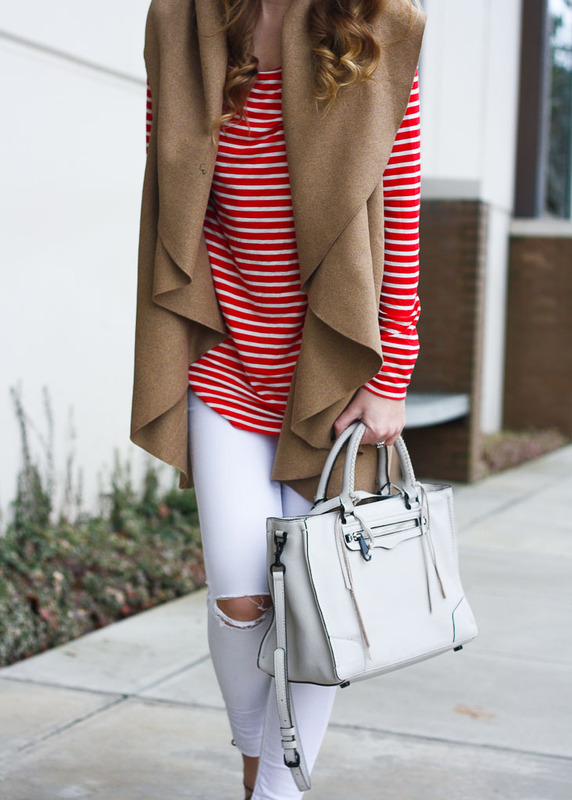 I’ve been sticking to very basic outfits lately as it is has been SO cold, and neutral colors are easy to layer up! 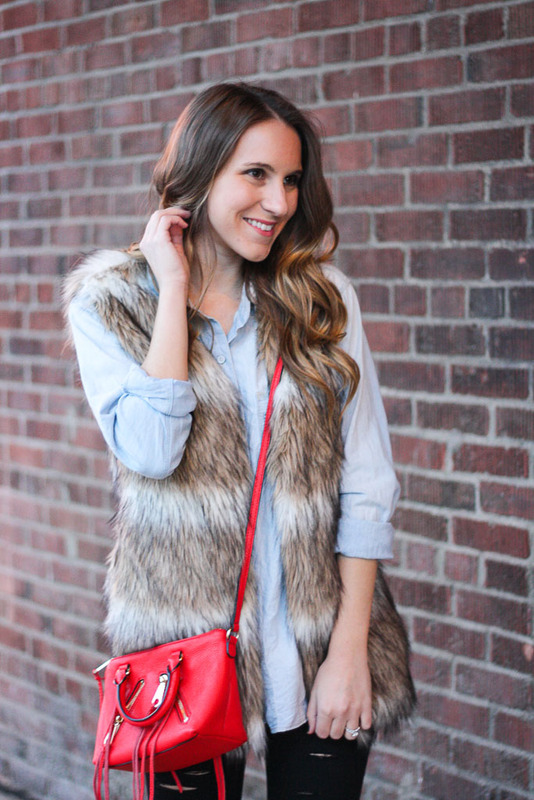 Black jeans and a chambray top can literally be paired with anything, so it was a no brainer to throw this faux fur vest on top! 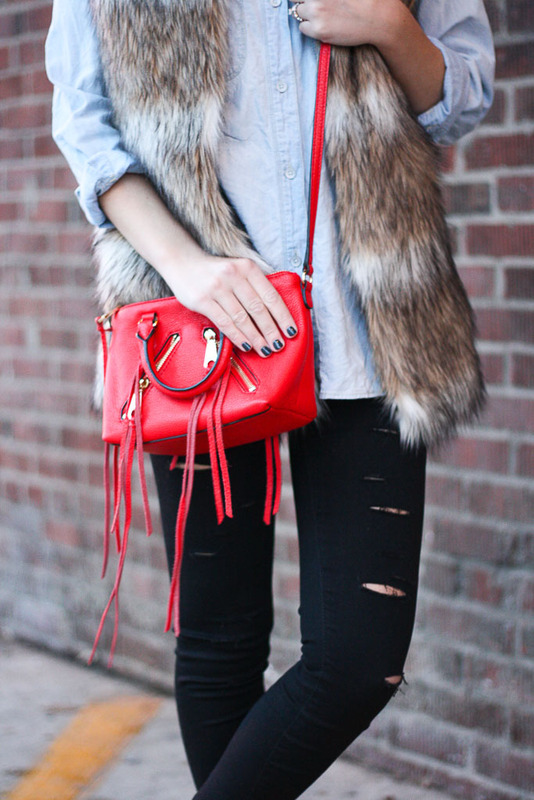 Add a pop of color (this red bag has been on repeat this winter!) and some black booties to complete an easy, chic weekend look!